This newly-designed body mount extension piece and snap pin set allows you to extend body mounts on your RC model car. They are intended to be used on those body posts which have been shortened for use with other bodies. 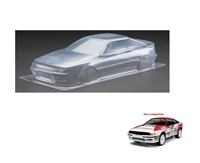 They are compatible with a wide range of major Tamiya touring car and M-Chassis models. 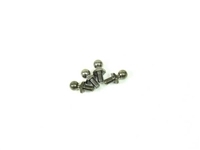 Usable with 5.5-6mm diameter body mounts. Compatible with TT-01, TT-02, TA05, TA06, TB-03, TB-04, XV-01, FF-03, M-05 and M-06 chassis body mounts. By replacing diff balls with these bushings the differential effect can be disabled to give the same effect as a spool diff. If the diff receives a strong enough shock, in the event of a crash, the bushings will allow the diff to slip, providing a slipper clutch effect. Compatible with cars with ball diffs that use 3mm diff balls. Fit these large diameter springs to your touring car equipped with TRF dampers for enhanced performance. These springs are larger in diameter compared to Tamiya’s original spring sets by about 1.2mm. The set contains 3 different spring rates to allow fine-tuning of your car’s suspension. The set includes different colored tubing so users are able to differentiate between spring rates quickly and easily. All springs have an inside diameter of 14mm. 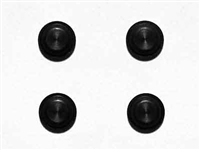 The ball connectors which serve as damper attachment points in many of Tamiya's cars are subjected to large stresses during driving that they may deform. 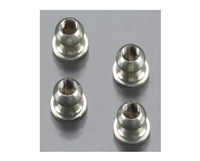 These ball connectors are made from a more durable type of aluminum and also feature a low-friction coating to ensure smooth suspension movement. 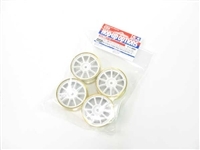 These limited edition medium-narrow wheels give your R/C touring car an extra visual accent. 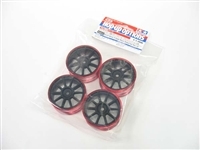 Perfect for R/C Drift cars! 2 types of wheels (Mesh & 10-Spoke) are offered in 2 colors (Black & White) with 4 different rim colors (Red, Blue, Chrome, and Gold). These wheels are metal-plated, painted in black or white, and finished with a clear coat over the rims. Medium-Narrow Wheels have offset +2, while 10-Spoke Wheels have offset 0. These wheels are metal-plated, painted in black or white, and finished with a clear coat over the rims. Medium-Narrow Wheels have offset +2, while 10-Spoke Wheels have offset 0. These on-road tuned springs feature a special Mica Black color surface. 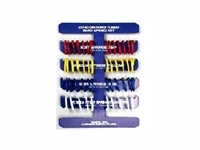 Each set contains Soft, Medium, Hard, and Extra Hard springs (2pcs. each) to allow fine setting adjustment of your favourite Tamiya Touring Car chassis according to the race track conditions. These on-road tuned springs feature a special Mica Blue color surface. Super Driftech Tires come conveniently pre-mounted on stylish chrome-plated wheels. These tires are made from low-friction resin material, enabling effortless drifting and reducing tire wear. 24mm width makes them compatible with any Tamiya touring car chassis as well. 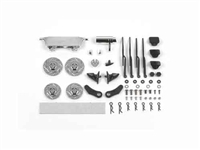 This set includes parts to depict front/rear wipers, side mirrors, muffler, intercooler and brake discs to dress up and detail your 1:10 RC touring car body.